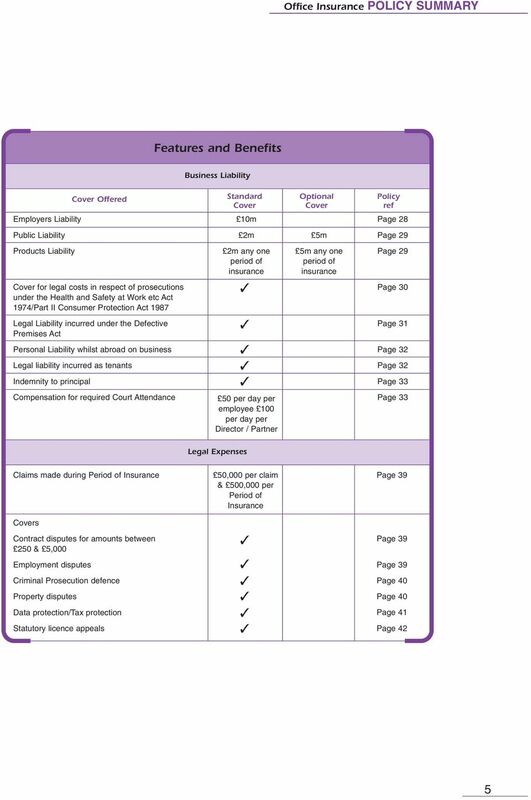 An Insurance package suitable for businesses in the professional services industry for example solicitors, accountants etc. Download "An Insurance package suitable for businesses in the professional services industry for example solicitors, accountants etc." 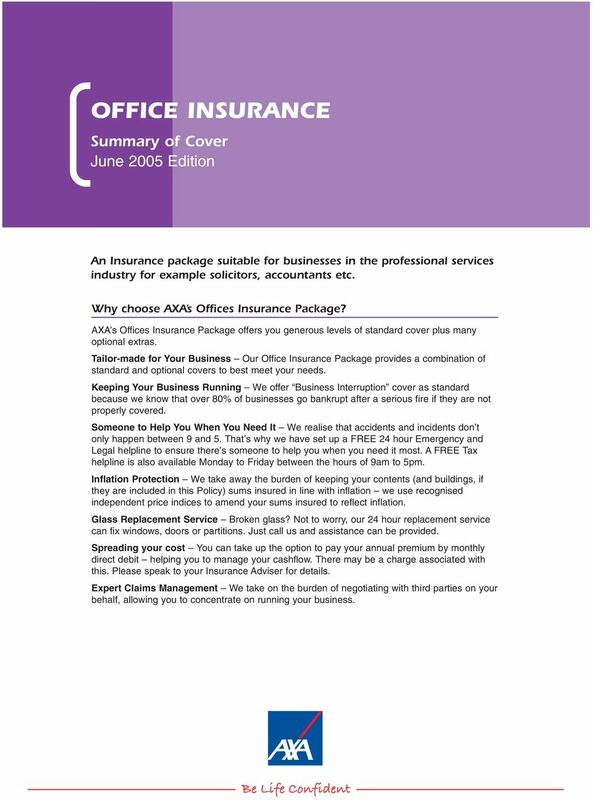 1 OFFICE INSURANCE Summary of Cover June 2005 Edition An Insurance package suitable for businesses in the professional services industry for example solicitors, accountants etc. Why choose AXA s Offices Insurance Package? AXA s Offices Insurance Package offers you generous levels of standard cover plus many optional extras. Tailor-made for Your Business Our Office Insurance Package provides a combination of standard and optional covers to best meet your needs. Keeping Your Business Running We offer cover as standard because we know that over 80% of businesses go bankrupt after a serious fire if they are not properly covered. Someone to Help You When You Need It We realise that accidents and incidents don t only happen between 9 and 5. That s why we have set up a FREE 24 hour Emergency and Legal helpline to ensure there s someone to help you when you need it most. A FREE Tax helpline is also available Monday to Friday between the hours of 9am to 5pm. Inflation Protection We take away the burden of keeping your contents (and buildings, if they are included in this Policy) sums insured in line with inflation we use recognised independent price indices to amend your sums insured to reflect inflation. Glass Replacement Service Broken glass? Not to worry, our 24 hour replacement service can fix windows, doors or partitions. Just call us and assistance can be provided. Spreading your cost You can take up the option to pay your annual premium by monthly direct debit helping you to manage your cashflow. There may be a charge associated with this. Please speak to your Insurance Adviser for details. Expert Claims Management We take on the burden of negotiating with third parties on your behalf, allowing you to concentrate on running your business. 8 Financial Services Compensation Scheme (FSCS) AXA Insurance is covered by the FSCS, which is triggered when an authorised firm goes out of business. In this unlikely event you may be entitled to compensation from the scheme. Compensation under the scheme for: Compulsory is covered in full. Non compulsory is protected in full for the first 2,000 and 90% of any amount above the threshold. Full details are available at Financial Services Authority Regulation AXA Insurance UK plc is authorised and regulated by the Financial Services Authority. This can be checked on the FSA s website at or by contacting them on WUY002RZ (01/06) (11094) AXA Insurance UK plc Registered in England No Registered Office: 5 Old Broad Street, London EC2N 1AD A member of the AXA Group of Companies. 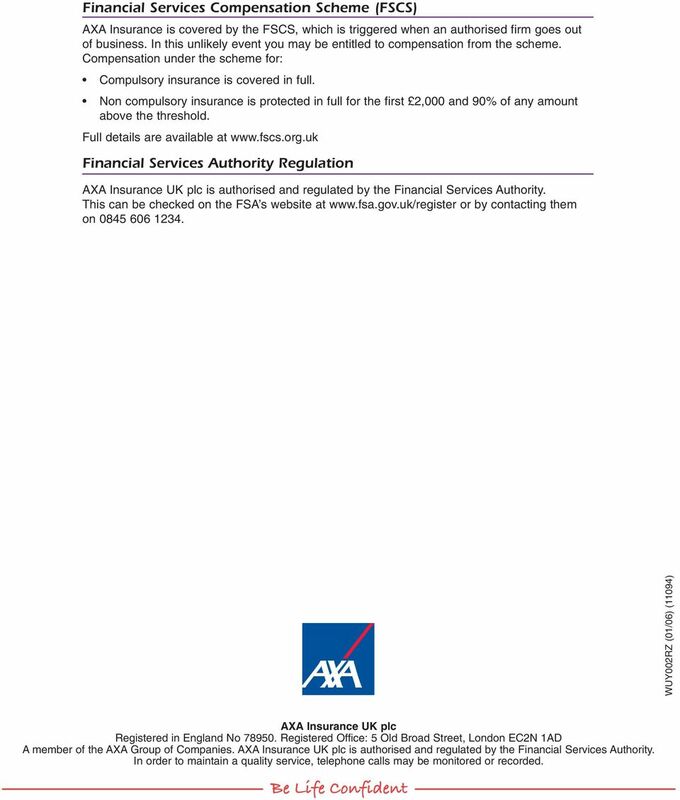 AXA Insurance UK plc is authorised and regulated by the Financial Services Authority. In order to maintain a quality service, telephone calls may be monitored or recorded. Shops Insurance. Summary of Cover September 2013 Edition. An Insurance Package for Retailers and Franchises. Why choose AXA s Shops Insurance Package? Hotels Insurance Policy Summary Hotels Insurance Summary of Cover September 201 Edition A business insurance package for hotels, motels, inns and guest houses. Why choose AXA s Hotels Insurance Package? 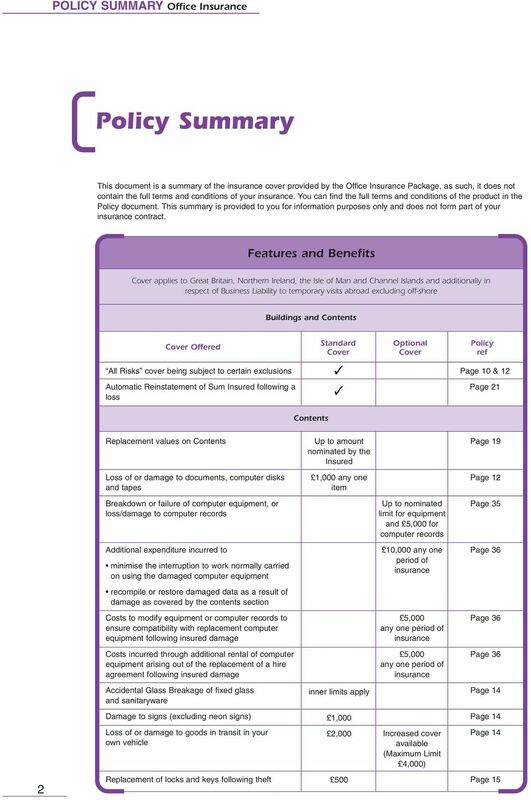 An insurance package designed for flat owners and residents of blocks of flats. 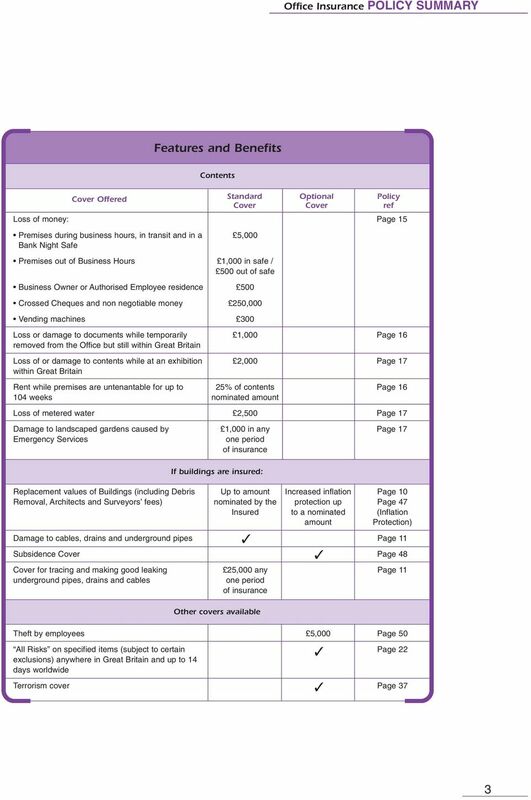 AXA s Flats Insurance Policy brought to you by Property UK offers you comprehensive standard cover plus optional extras. 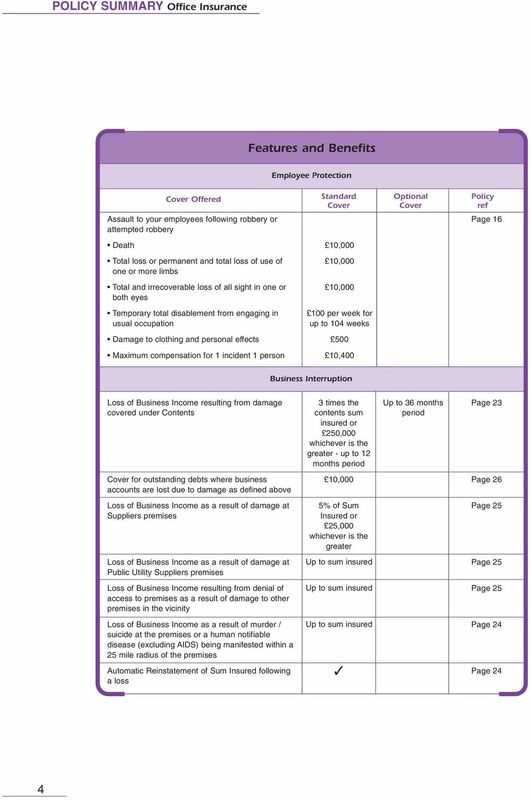 A business insurance package available for self employed persons and small businesses (including limited companies) with up to 5 employees. BUSINESS INSURANCE. S u m m a ry o f C o v e r December 2013 Edition. An Insurance Package for Businesses. Why Choose InterCounty s Insurance Package? You should read this Summary of Cover in conjunction with your Policy Schedule and Policy Wording. You should read this Summary of Cover in conjunction with the Policy Schedule and Policy Wording. Business Policy Summary 2 Business Policy Summary Business Policy Summary Your RSA Business Policy is an annual contract which may be renewed each year subject to your needs and our terms and conditions. The Tradesmen policy is available for self employed persons and small businesses with up to 8 people and a turnover of 500,000 or less. The Professionals policy is available for small businesses with up to 8 people and a turnover of 500,000 or less. To ensure that this Policy continues to meet your needs you should review and update your cover periodically. Countrywide Insurance Services. Home protection plan. Exclusive to Countrywide. Proud to be associated with. www.countrywideinsurance.co. 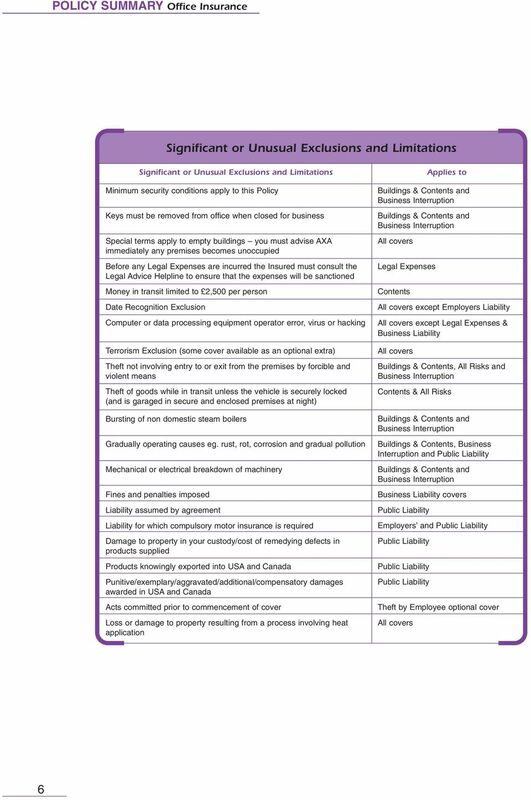 This policy summary does not contain full details and conditions of your insurance you will find these in your Policy Wording. properties Policy Summary 2 Properties Policy Summary Properties Policy Summary Your RSA Properties Policy is an annual contract which may be renewed each year subject to your needs and our terms and conditions. BMW HOME INSURANCE POLICY SUMMARY. Choices Extra Policy Summary Choices Extra is underwritten by Royal & Sun Alliance Insurance plc. It is an annual contract and may be renewed each year subject to the terms and conditions then applicable. Adelaide Homeshield Policy Summary Homeshield is underwritten by Royal & Sun Alliance Insurance plc. It is an annual contract and may be renewed each year subject to the terms and conditions then applicable. Full details of what you have chosen are shown in your personal quotation and policy schedule. 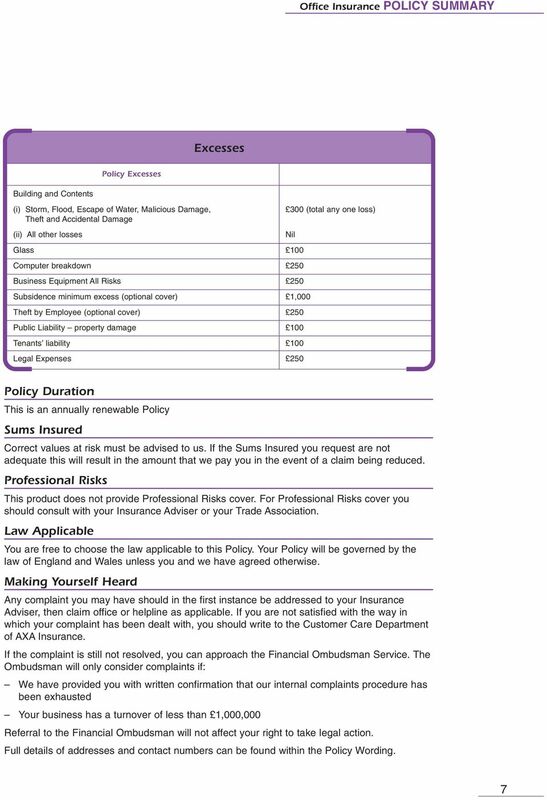 1 HOME INSURANCE EXTRA POLICY SUMMARY. Our Home Insurance Extra policy provides you with home and contents cover. You can also purchase additional sections of cover to tailor the policy to your needs. NAME OF INSURER: Chaucer Insurance - a trading name of an authorised Lloyd's syndicate managed by Chaucer Syndicates Limited. VFM Cover Select is a trading name of QMetric Group Ltd. who are authorised and regulated by the Financial Conduct Authority.